The European Rugby Challenge Cup and Champions Cup Finals come to St James' Park in Newcastle on 10 and 11 May this year and there's two great matches in prospect. As well as the matches, you can also have fun in one of the Fan Zones in some great City Centre locations and on the iconic Quayside. The atmosphere will be great as we welcome visitors from around Europe to the North East. We’ll be making sure that you can get to and from each game with our bus services running into central Newcastle, plus we will also be running a dedicated Park & Ride service from intu Metrocentre Coach Park for each match. 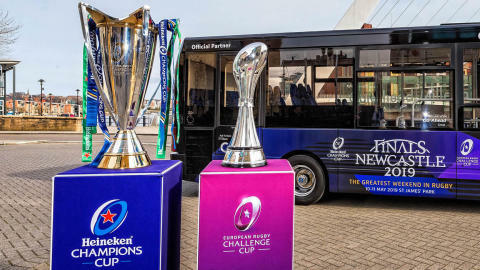 To celebrate our participation in the Trophies Tour, we've got four Heineken Champions Cup Final tickets to give away, as well as four European Rugby Challenge Cup Final tickets. All you have to do enter is upload your photo(s) of the trophies and/or bus on the tour and submit your details using the below link. Getting to St James' Park is really easy with a dedicated Park & Ride bus service running from intu Metrocentre for both the Challenge Cup and Champions Cup Finals. The X50 runs non-stop from Metrocentre Coach Park to St James' Park every few minutes from three hours before the kick off of each game until 20 minutes before the scheduled kick off time. Free car parking is available in Metrocentre Coach Park, with the Coach Park signposted from the A1 at the A184 junction. Buses return from St James' Park at frequent intervals after each match, with the last bus leaving two hours after the final whistle. If you arrive earlier at Metrocentre or want to leave Newcastle later, Go North East run fast and frequent buses which leave from Stand L in the Metrocentre Interchange for Newcastle, and from Stands C and D in Eldon Square Bus Station in Newcastle for Metrocentre. The X50 leaves from the Metrocentre Coach Park and on Barrack Road in Newcastle (just outside St James' Park). Travel all day on any Go North East bus between Metrocentre and Newcastle with our Newcastle/Metrocentre Day Saver ticket for only £4 per person. Tickets can be bought from the bus driver on the day, or can be purchased in advance from the Go North East app. Car parking is free in the Metrocentre Coach Park, with the Coach Park signposted from the A1 at the A184 junction.